Karaoke machine hire and equipment rental has become very popular in recent years as technology has moved on. Good quality karaoke machines have become available that are easy to setup and use, have good sound quality and a large selection of songs, thus allowing anybody to include karaoke at their party. Karaoke machines come in all shapes and sizes and have different capabilities and facilities. 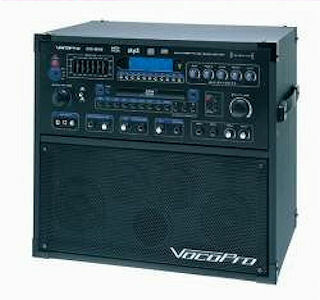 Depending upon your requirements you will need to choose the appropriate karaoke machine to hire. Below is some useful advice to help you choose the right karaoke machine or equipment for your event. There is also advice on things to look out for when choosing your supplier for your karaoke machine or equipment hire. Your choice of karaoke machine really depends on your requirements. You need to consider the size of your party and the karaoke facilities you would like to have available. Anything but a very small party will require sufficient sound output and suitable displays for lyrics. To make the karaoke experience enjoyable for everyone you will need to ensure you hire a sufficiently large selection of karaoke songs and a simple way of looking up and selecting songs to play. You should also consider hiring a karaoke machine that allows multiple microphone inputs, provides professional vocal reverb and echo, allows key change of the backing tracks and allows the sound to be changed via a graphic equaliser. These facilities all help to create a better quality and balanced sound so good singers are not discouraged from taking part. If you are planning a small party at home and simply want a basic, fun karaoke experience, then you could look at hiring minimal karaoke equipment that you can connect to your own TV and/or sound system. This will help keep the costs down for you. The equipment would include a karaoke player, a mixer with professional vocal effects, microphones and of course a good selection of karaoke songs and karaoke song books. If your TV or sound system isn't really suitable, then you would also need to hire a TV and sound system which would increase the price slightly. Your karaoke hire supplier should be able to discuss your requirements and existing equipment with you and recommend an ideal setup for your party. There are some all-in-one karaoke microphones available which can simply be plugged into your TV. However, if you are looking at these, check that the song selection will be okay for your requirements. Also be aware that the vocal processing, adjustments and mixing on these microphones may not be brilliant and rather limiting so you may not have the flexibility to achieve a great sound. It's also worth considering how well your singers are going to treat the microphones as they aren't just basic microphones and need treating with some respect! It's worth asking questions first or even requesting a demo, as a poor sound or poor selection of songs will really spoil the overall karaoke experience. The advantage of these types of microphones though is that they have all the karaoke backing tracks and lyrics stored on the microphone itself and are therefore one of the simplest possible solutions for getting karaoke at your party, as long as you have a decent sized TV with good sound to plug it into. For an average sized house party you will need to ensure that you have sufficient TV displays and sound system to make sure the sound is loud and clear enough and people can see the lyrics clearly. You may have a suitable TV and sound system already, in which case you can hire minimal karaoke equipment as described above for small parties. However, if you're not sure, it's probably better to discuss your requirements with your supplier so they can provide you with the right equipment for the job. There are also dedicated karaoke machines for hire that include karaoke player and sound system in one unit. These are very simple to setup and simply require connecting to a TV. An example of such a machine is shown below. Such machines have a good sound output, professional vocal reverb effects, key change, graphic equalisers, multiple microphone inputs, external TV connections and more. Some have thousands of songs built in, others accept standard karaoke CDG discs or DVDs, therefore only limiting your song selection to the number of CDGs/DVDs you have hired. Some people may bring along their own custom karaoke discs and these machines will allow these to be played too. For any party larger than an average house party you will need to consider hiring karaoke equipment suitable for a larger venue. This will typically include speakers, an amplifier, mixer, microphones, TVs, karaoke and music players, karaoke CDs, karaoke song listings and request slips for your guests, a large selection of wires and suitable lighting. You can certainly hire all this equipment, but make sure somebody knows how to set it up and operate it correctly as it's not as straight-forward as a plug-and-play setup. It is often easier and far less hassle to hire a mobile Karaoke DJ for such larger parties as they will supply, setup and operate the equipment, host the party and provide suitable music for your party too, leaving you and your guests free to enjoy the party. Click here for advice on choosing a mobile Karaoke DJ. Firstly, consider your karaoke requirements based on the suggestions made above. Once you have a clear idea of the kind of setup you will need, call a few local karaoke machine/equipment hire companies and ask them specific questions about the equipment they have available, it's features and suitability for your event. If you are having a small to average sized house party, try and keep it simple and go for a plug-and-play option. For larger parties, consider hiring a mobile karaoke DJ rather than just hiring the equipment and trying to do battle with it yourself. Whichever option you choose, always ensure that your karaoke machine hire supplier will deliver, setup and test the karaoke equipment for you and show you how to use it. Check they have delivered everything you need, including the karaoke songs and song listings! Ask about the karaoke song selection they will be providing. If possible ask to see a copy. There is no point having a fantastic karaoke machine setup if there are no songs that people want to sing. Ensure you are aware of any contractual obligations in the event of any damage to the karaoke equipment. Try and look after it, it's not cheap to replace! Ensure it is clear when your supplier will return to collect the equipment and make sure it is ready for collection. A few legalities to be aware of. Karaoke machine and equipment suppliers should have PAT test certification for the equipment they are supplying. Always ask them for this before booking. They should also have Public Liability Insurance. Again, ask about this before booking. If they are using karaoke tracks that have been converted from the original media they were purchased on (eg MP3+G files on a laptop converted from CDGs) then they should have a ProDub licence issued by the MCPS and carry appropriate certification. Please see our articles on this site for full details on PLI, PAT and Produb. Finally, enjoy your karaoke party!